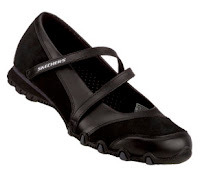 Recently I bought a pair of Skechers shoes (see picture). They were on sale, and I cannot resist buying shoes especially when they are on sale! I don't normally buy brand names when it comes to footwear, but that pair of Skechers looked comfortable and since the cold weather is coming, a new pair of shoes that cover the whole of my feet would come in handy. The shoes are not as comfortable as they looked. I have been wearing these shoes regularly since I bought them. A few days ago, I started to feel some pain on the ball of my left foot. The shape of the shoes feels strange to me. It doesn't seem to fit naturally on my feet. The shape is such that my weight does not seem to be distributed evenly on my feet. There seem to be more pressure on the outward side of my feet but it seems my left foot is the one that seem to experience more of it. I wonder if the shape is more for American/European feet? Most Asians walk bare foot in the house and of course our toes are not strange looking and our feet are more straight looking when compared to people who wear shoes all the time even when in the house. Late last year I bought a pair of Clarks sandals. That pair of sandals were also shaped strangely. They were more curved inwards. That pair of sandals were not comfortable for at least a couple of months but being sandals there was more room for my feet to get used to them. Better don;t wear them if it continues to hurt.